The Fourth of July is next week, how is summer passing by so quickly? At the end of this week I'll be leaving for my family vacation to Lake Tahoe and celebrating the holiday with there! Although I'm still planning my look for the day, I'll most likely be going with something pretty casual. The fourth isn't always a huge celebration for my family, but I still like to dress in red, white and blue! I've rounded up some of my favorite pieces for the holiday to give you a little inspiration. That stars and stripes top is definitely my favorite though! We normally spend the day hanging out together and sometimes my dad will barbecue for us if it's nice out. At night if we have them we'll throw those little popping fireworks too, so we still get that little taste of fireworks! Even though we don't do most of the traditional holiday things, it's still a great day because I get to spend it with the family! What do you do for the fourth of July? Love all your picks, especially the blue dress! So many great picks!! I literally love them all! I love that off-the-shoulder red dress! I love every thing you picked, seriously! Definitely going to be investing in the blue dress and red fringe earrings! You are so ready for the 4th! Love your cute picks! I've gotta have that cute striped suit! That star and stripe tee is great too! Too many cute options! These picks are everything!!! I want it all!!! I love family BBQs to celebrate the 4th! Hope you have a great time at Lake Tahoe! I have those perforated booties! They are seriously SO comfortable!!! These are all such great picks! I have no idea what I'm wearing yet, but this is giving me some major inspo! Love it all! It's always fun to wear red, white, and blue for the 4th. Fun picks! I love holidays you can dress festive for! 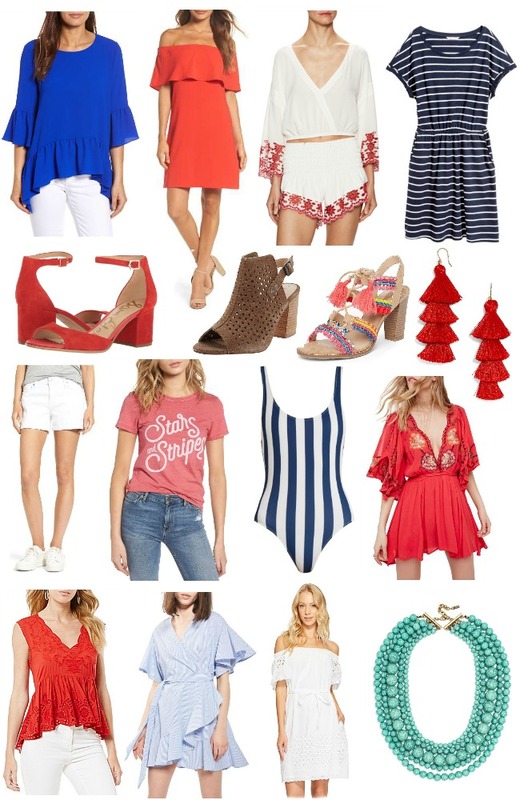 great picks for july 4th! Yes, yes to everything! I have no idea what to wear for the 4th so these are sparking some serious inso. These are all so cute! I love the blue striped swimsuit! So many cute picks! All perfect for the 4th! I have that blue striped wrap dress and I didn't even think about wearing it for the 4th of July, good idea!!! So many fun and festive picks!! Ooh I love that embroidered red dress! So cute! In love with the red romper! And our town has a food and fireworks festival on the 4th that I always attend, so that's my plan! So many great picks! I love the more casual, t-shirt options! Love it all!! Such great picks! This is such a great roundup - I love the stars and stripes graphic tee!